Events in the Gulf of Mexico—hurricanes, oil spill, red-tide algae blooms—have shown the need for real-time accessibility of oceanographic data for this region. Quick access to this information can show the extent of damage and help in planning responses. 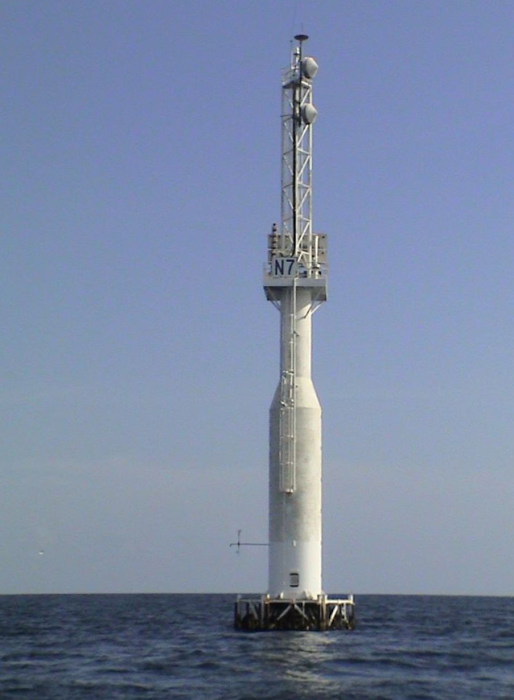 In response to this need, Florida State University (FSU) was asked to design a telemetry system that would retrieve oceanographic measurements from a tower located about 12 mi off shore. The tower already hosted a weather station with various atmospheric instruments and a Campbell Scientific CR3000 datalogger. The CR3000 collected and stored data from the sensors and then transmitted the data to shore via a radio modem. Meanwhile, 625 ft away on the ocean bottom was a set of instruments collecting oceanographic data. But access to this data was sporadic and difficult, since each of the oceanographic instruments stored its data until divers could visit the site, uninstall the instruments, go to the surface and retrieve the data, and return the instruments to the bottom. FSU had the task of integrating this existing group of oceanographic instruments into the datalogger-and-radio system on the tower for regular transmission to an onshore station. This integration would make a huge difference in the accessibility of this information. The dataloggers are so user-friendly that Eric Howarth, a biologist with FSU, was able to design a system in which a cable carries the data from the sensors, through a conduit secured to the ocean bottom, then up to the telemetry system high on the tower. As the system now functions, the oceanographic sensors—including a Teledyne acoustic Doppler current profiler (ADCP) and a YSI sonde—are mounted in a protective housing in water 66 ft deep. The instruments measure current speed and direction, wave height, water temperature, conductivity, pH, turbidity, and dissolved oxygen and nitrate. They are connected by cable to a CR1000 on the tower. Two SeaBird SeaCat 16 sensors are mounted to the underwater portion of the tower at different depths to measure temperature and conductivity, and they are also connected by cable to the CR1000. The CR1000 is able to take input from this variety of sensors, process it, and pass the data to the CR3000. Programming can be changed on site or from the onshore station. The CR3000 transmits both the oceanographic data and the atmospheric data (from the sensors on the tower) via radio to an onshore site. The dataloggers’ ability to communicate with each other, with sensors, and with other peripherals via PakBus (our own protocol), Modbus, and RS-232 is a significant benefit to the project. The integration of the oceanographic instruments with the telemetry system on the tower results in a reliable, low-power solution. This solution enables consistent flow of data from the underwater sensors, and remote control of measurement frequency and power supply.